ACCRA- Hundreds of mourners dressed in black mourning clothes, gathered at the Accra International Conference Centre, to mark the end of three days of national mourning for Kofi Annan. World leaders past and present, traditional rulers and global royalty September 13 joined the family of Kofi Annan to pay tribute to the former UN Secretary General at a state funeral that took place in his native country, Ghana. The respected diplomat’s casket was centre stage at the religious service and surrounded by flowers and candles as prayers were held. Thousands of people filed past the coffin, which was draped in the red, green and gold Ghana national flag and guarded by the military in ceremonial uniform. The change of flags from the UN flag could have been to symbolize the hero’s body arrival at his country of origin. The Most Reverend Daniel Sarfo, the Anglican bishop of Annan’s home city of Kumasi in Southern Ghana said the prayer for all people is to emulate the service that Mr Annan has rendered to mankind. “No matter what we are, we will also die but today history is being made in Ghana. One of our illustrious sons is lying here,” he told the congregation. “But we are grateful that God used him over the years to work for humanity, for peace. Today, as he lies here, he has finished his work,” Most Rev Sarfo added. 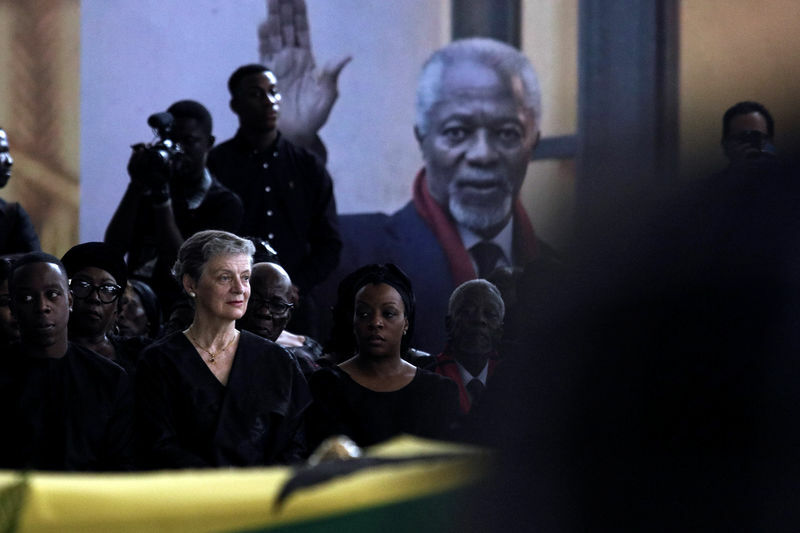 Ordinary Ghanaians and dignitaries have paid their respects to Annan since his coffin was returned from Geneva and received with full honours on September 10. Many Ghanaians described Annan as a father-figure and a source of national pride for Ghana. Mr Antonio Guterres, the UN Secretary General led mourners from the diplomatic corps, while there were representatives of the African Union, the West African bloc ECOWAS, and presidents from across Africa and beyond. Royalty included Princess Beatrix, the former queen of the Netherlands, and her daughter-in-law Princess Mabel, both close friends to Annan. The funeral will be followed by a private burial at the capital’s military ceremony which will include a 17-gun salute. This funeral closes the final chapter in the history of a man who has been exalted for his contribution to humanity in the world. Mr Annan led the UN from 1997 to 2006 and was the first from sub-Saharan Africa to do so. He died on August 18 aged 80 at his home in Switzerland after a short illness. Mr Annan devoted four decades of his working life to the UN, and was known for bringing quiet charisma to the role. Many describe him as a man who lived a life of dedication and service above self and that if he ever felt any pain or regrets, then it was sealed under a jolly, easy going and friendly personality that he portrayed through his life. Mr Annan was awarded the Nobel Peace Prize in 2001, as the world was reeling from the September 11 terror attacks in the United States, jointly with the UN “for their work for a better organised and more peaceful world”. Annan kept up his diplomatic work, taking mediation roles in Kenya and Syria, and more recently heading an advisory commission in Myanmar on the crisis in Rakhine state. Mr Annan is survived by his wife Nane Maria, four children and grandchildren.